Global Divestment Mobilisation – That’s a wrap! Thousands of people participated in over 280 events in 45 countries to put pressure on institutions to break their financial ties with fossil fuel companies, during the Global Divestment Mobilisation which ran from 5th to 13th May. 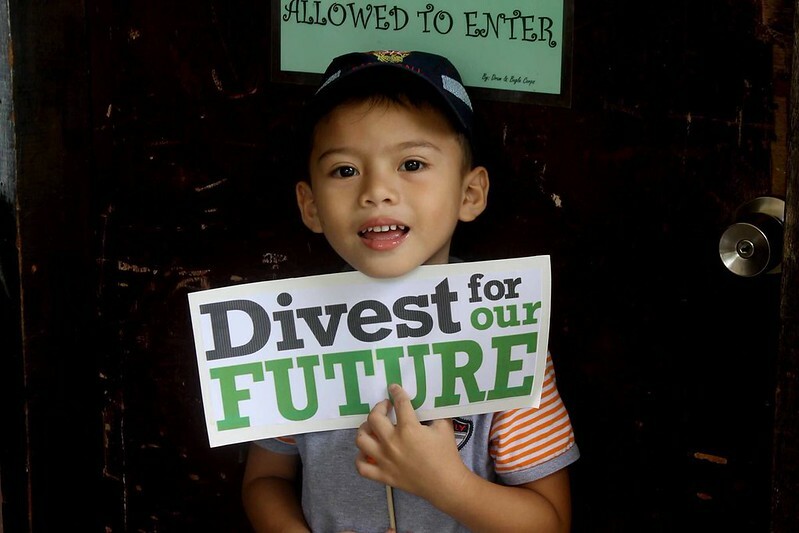 The divestment movement, which started in North America, Australia and Europe has now gone truly global and spread to Asia, Latin America and Africa. While governments keep dragging their feet, people from all walks of life stepped up and demonstrated real climate leadership. The divestment movement is now a global force that poses an ever growing challenge to the power of the companies that are the most responsible for causing climate change: the fossil fuel industry. During the Global Divestment Mobilisation, events spanning six continents challenged municipalities, faith, health and cultural institutions, universities, pension funds and banks to divest from fossil fuels. The links between municipalities and fossil fuel companies came under scrutiny across Europe and elsewhere. In New York 150 activists rallied inside Trump Tower, to call on New York City officials to cut their ties with the oil and gas companies that control the White House. Over 1000 people marched in Munich, Germany demanding divestment and more climate action. Göttingen and Bremen became the fourth and fifth German city to divest from fossil fuels. In Denmark, campaigners celebrated the twelfth divestment commitment by a Danish city. Demonstrations across the UK including rallies at 14 town halls across London called on municipalities to pull their funds out of coal, oil and gas. Faith groups took a moral stand and committed to divest including over a quarter of Quaker meetings in Britain and nine Catholic institutions. A group of 30 clergy including three Church of England bishops sent an open letter to the Church of England Pensions Board, asking them to divest from fossil fuel companies and to invest in renewable alternatives. In Brazil over 3,000 people participated in prayers in a vigil outside the Umuarama Cathedral, to voice their hopes for a future free from fossil fuels. In the Netherlands, teachers, scientists and civil servants confronted the national pension fund ABP that continues to invest their pension savings in fossil fuels. A cross-party group of fifty MPs backed the call on the UK parliament’s £612m pension fund to ‘take climate change seriously’ and divest from fossil fuels. Artistic performances at cultural institutions such as the Louvre in Paris, the Van Gogh museum in Amsterdam and the British Museum called for an end to fossil fuel sponsorship of the arts. Campaigners in Stockholm, Sweden staged a ‘flood’ in front of the Nobel museum to urge the Nobel Foundation to divest. Students and academics challenged universities in Argentina, Bolivia, the Netherlands, Germany, South Africa, Nigeria and Hong Kong to divest. French and Flemish speaking students at six universities in Belgium released a joint open letter calling on their institutions to stop investments in fossil fuels. Banks felt the pressure to divest from coal plants, tar sands, pipelines and fracking. In the UK, activists targeted Barclays to stop investing in fracking. During an event in Japan case studies of Japanese banks financing coal power plants in Indonesia and oil pipelines in the United States were highlighted to put pressure on Japanese banks to pull out of fossil fuels. In New Zealand and Australia campaigners targeted Australian coal giant Adani by calling on the banks that invest in it, including CommBank to stop its funding. Over 730 institutions across 76 countries with assets of more than US$5.5 trillion have so far committed to pull investments out of fossil fuels. In the face of unprecedented climate impacts, divestment aims to undermine the power of the fossil fuel industry as the main driver of the climate crisis.